Though I have been impressed by Terry’s intuitive abilities, when he proposed that Brian May is an incarnation of a founder of the field of physics, Isaac Newton, my first reaction was that this hypothesis is ridiculous! I did realize that the hairstyles of Newton and May are very similar and that the facial resemblance between Newton and a young Brian May is stunning. Click on images to enlarge them. Reincarnation research also reveals that we, as souls, generally follow similar careers and pursuits from one lifetime to another. Musicians tend to return to life as musicians, scientists continue to expand science, politicians are reborn to pursue political careers, and so forth. 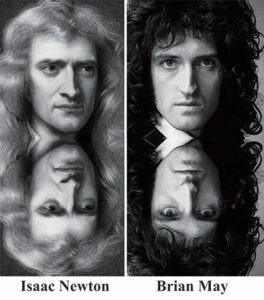 Due to this principle, I found the hypothesis that Isaac Newton reincarnated as Brian May implausible. Then, I learned that following his career as a rock star, Brian May obtained a doctorate degree in astrophysics from Imperial College London. Further, May was a science team collaborator involved in the NASA New Horizons Pluto flyby and he attended the watch party as the craft later flew by the Kuiper belt, which is a band of small objects made up for frozen water and frozen gases, such as methane and ammonia. May also co-founded Asteroid Day to bring awareness to the danger that wayward asteroids can pose to the survival of planet Earth. An asteroid was even named after May. He also served as Chancellor of Livermore John Moores University. Isaac Newton, by the way, was also passionate about astronomy and built the first practical reflecting telescope. In terms of an interest in music, all that I could find is that Newton explored the mathematical principles that underlie music, but to my knowledge, he did not play a musical instrument. In a session with Kevin Ryerson, a world-famous trance medium who channels a spirit being named Ahtun Re, who has demonstrated the ability to make past life identifications with a high degree of accuracy, Ahtun Re affirmed that Brian May is an incarnation of Isaac Newton. One discrepancy in this case is Newton’s extraordinary renown in the fields of mathematics and physics, relative to that of Brian May. This, though, is how reincarnation works. One can have similar abilities and interests in multiple lifetimes, but in a particular incarnation, a soul may hit the jackpot in terms of fame, yet be relatively unknown in other lifetimes. As an example, George Washington has achieved God-like status in the United States as he is considered the father of the country. 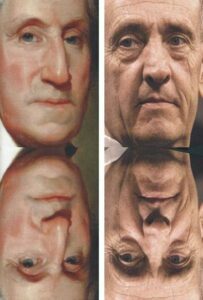 A contemporary incarnation of Washington has been identified in the persona of Tommy Franks, a now retired 4-star general who led the war on the Taliban in Afghanistan following the 9/11 World Trade Center attacks. He later became the Commander of US Central Command. Similarly, Isaac Newton was alive in the 17th century to help establish the foundations of physics, which led to his status and fame. He is alive again today in the person of Brian May. Physical Resemblance in Reincarnation Cases: The facial features of Isaac Newton and Brian May are similar in a very striking way. Past Life Talent: Bryan May has become a world-class physicist and astronomer, much like Isaac Newton. I do thank and applaud Terry Olesen for proposing this exciting reincarnation case.